After our summer in Europe and the US, we flew back down to Chile in order to set off from San Pedro de Atacama to undertake the incredible Salar de Uyuni Salt Flats tour. All we wanted before being thrust into freezing cold temperatures, 4,800m altitude, mediocre food (and did I mention three days straight of off-roading?) was a pair of fuzzy slippers and a bit of pampering. 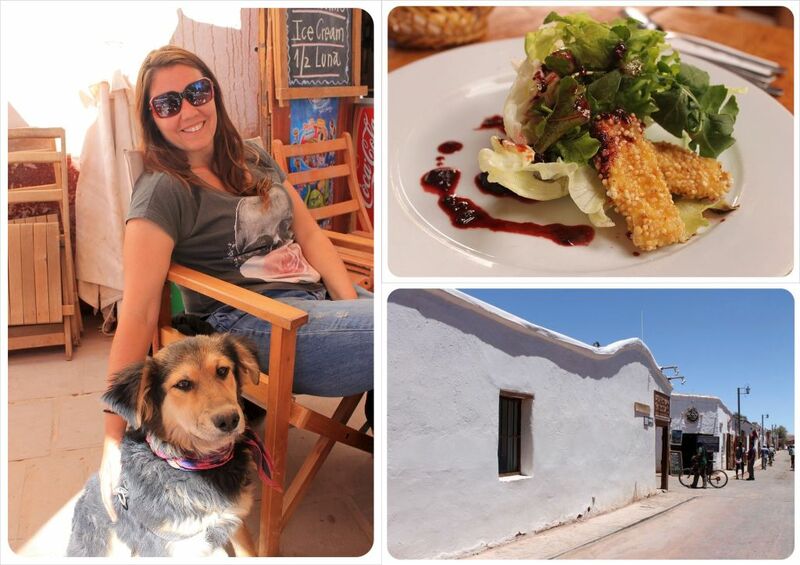 Surprisingly, San Pedro de Atacama does luxury very, very well on the whole. At the top of the accommodation pyramid, there are three to five high-end luxury resorts that can charge upwards of $500 a night. 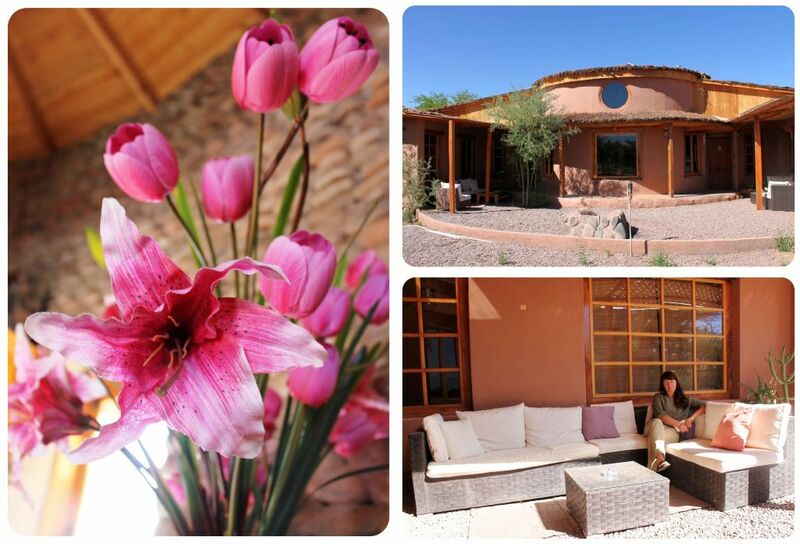 That drops dramatically in the mid-range, which is why we opted to stay at Atacamadventure Wellness and Ecolodge. 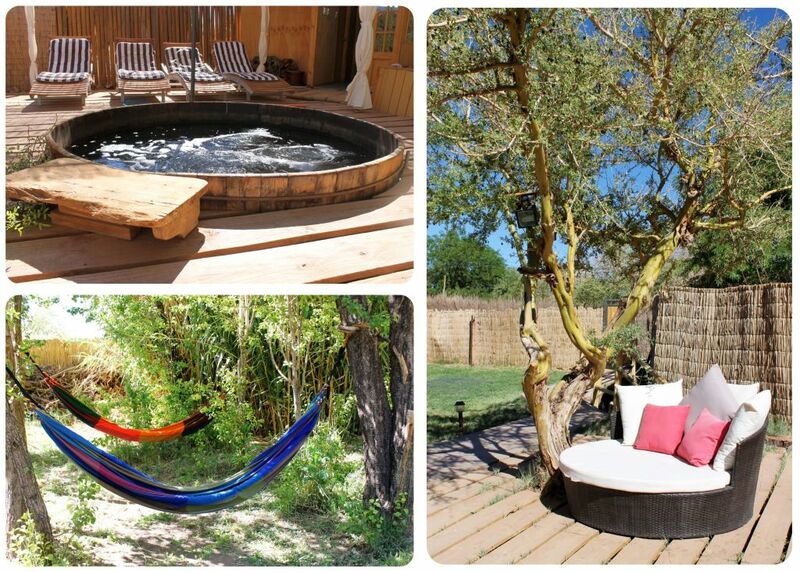 An eco-friendly boutique Bed And Breakfast, Atacamadventure offered exactly the kind of (guilt-free) pampering we are looking for – a hot tub, pool, sauna, massage studio plus homemade organic breakfast. 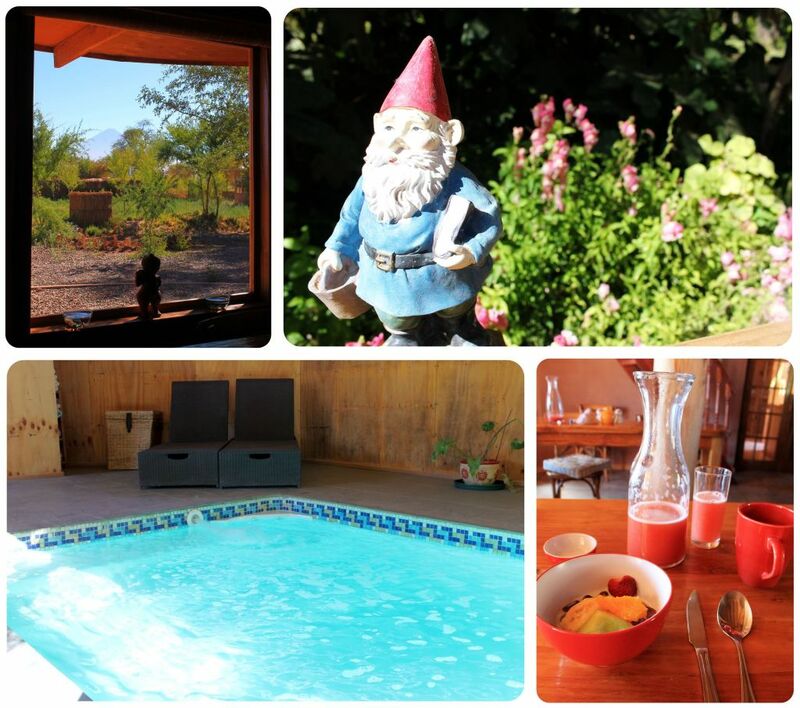 In addition, the hotel uses primarily solar energy and has incorporated a centuries’ old local irrigation technique that offers you lovely green spaces once you step inside this off-the-beaten path resort from the burnt orange desert dirt outside. Although most resorts and even some hostels offer free pick-up and shuttle service into the downtown area, Atacamadventure does not. The taxi driver had never heard of it and it was an adventure finally landing upon this hidden hotel. Once inside, however, this is a beautiful little escape. The first owner started taking in a boarder or two until she built on a separate cottage. Then, as time went on she added on an additional five rooms. All six are very different, and we were incredibly impressed with ours. 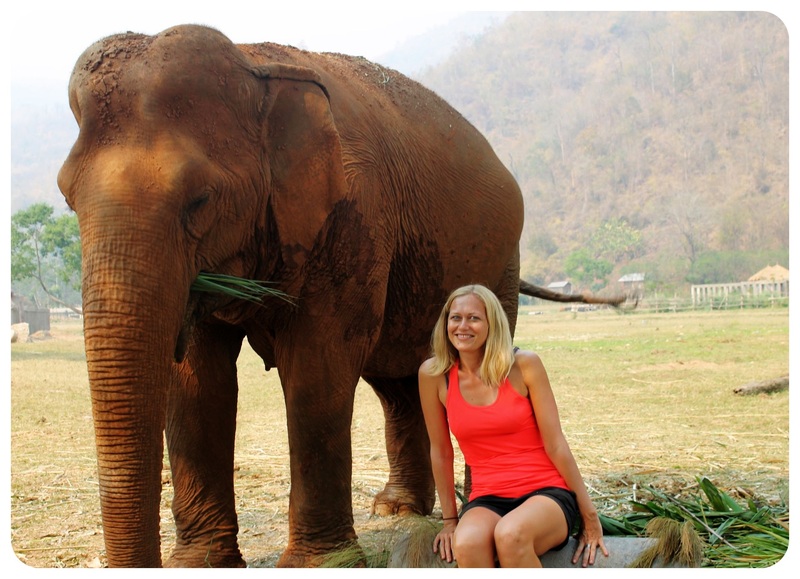 First impression – it was huge. King size bed? Check. 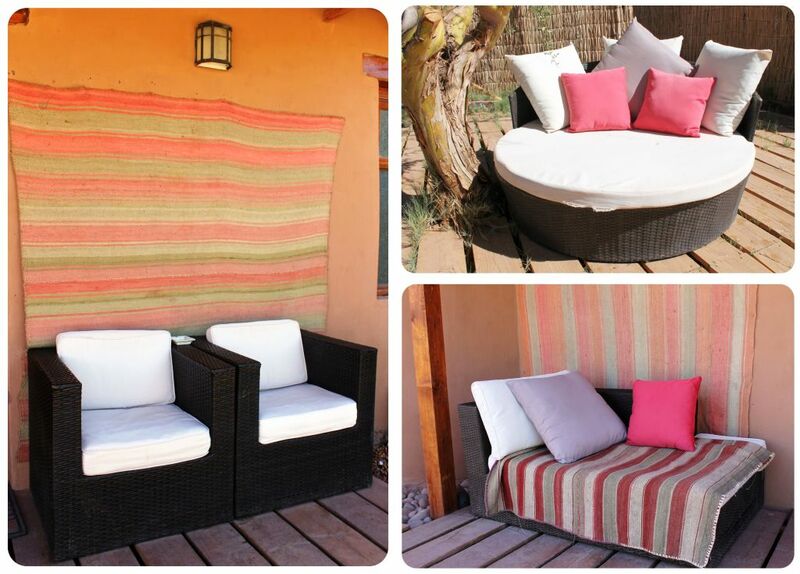 White fluffy pillows? Four checks. Desk with a oddly professional office chair? Check (although this pressured me to actually get some writing done!) Walk-in closet with about twenty shelves? Check. And the bathroom! 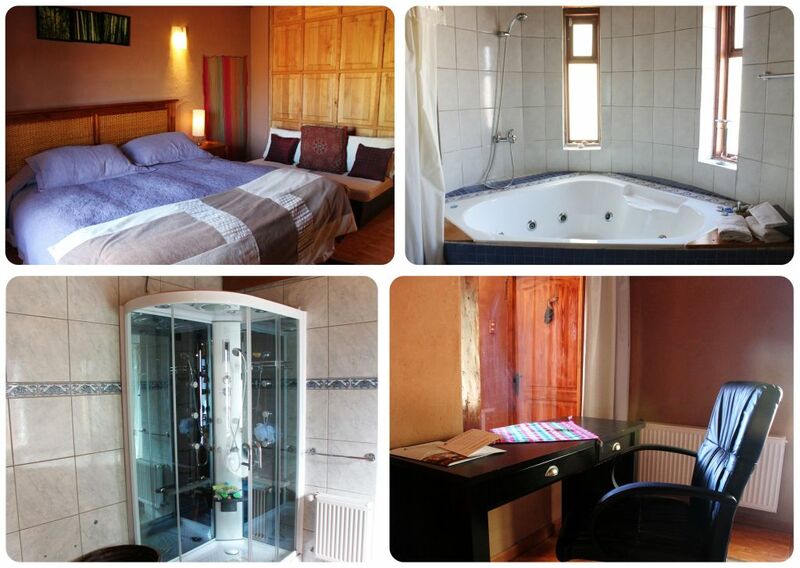 The bathroom alone was larger than most private hostel rooms available in San Pedro proper. We had hers and hers pedestal sinks, a jacuzzi tub and a stand-up jacuzzi shower, big white towels and fuzzy slippers. After our long journey we skipped dinner and flopped down into bed. Even though we almost never watch TV, the receptionist had mentioned it when she was showing us around the room (that’s how big the room was, she could show us around in it). But when my fingers crawled along the nightstand looking for the remote, they came up empty. There was, in fact, no TV in the room and we were so tired we had hardly noticed. We fell asleep five minutes later anyway. There is one large TV in the lounge upstairs to share, but the focus here, explained the manager, is on escape, powering down and soaking up the natural environment. Refreshed and seriously starving, the next morning we couldn’t have been happier with the breakfast. 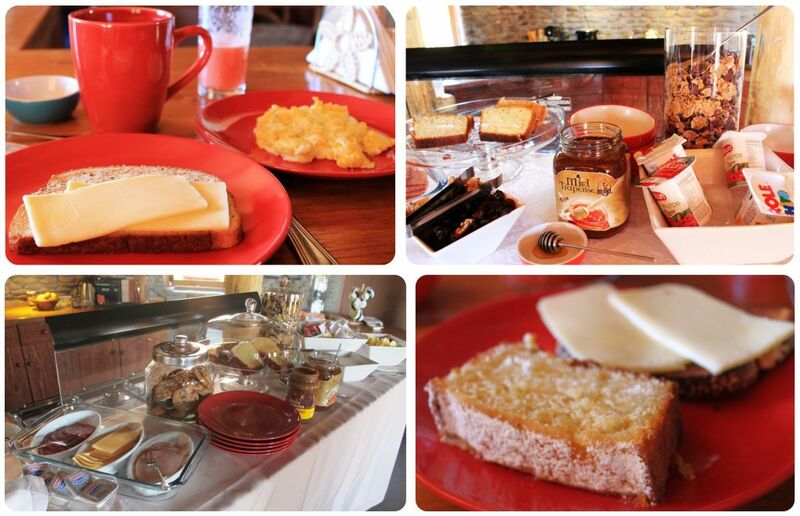 We ordered made-to-order omelets from the short, no-nonsense cook in charge, who also showed us the fresh brewed coffee, tea, hot milk, bowls which we filled with fresh fruit, homemade yogurt and plate which we piled high with homemade cakes, bread slices, cheese, butter and jam. With our bellies full we headed into town to get some work done (the wi-fi signal here was non-existent) and returned in the afternoon with plans to hit the outdoor jacuzzi and sauna. Two older couples had beaten us to the jacuzzi and at $70 an hour, the infrared sauna wasn’t worth it, so instead Dani grabbed a glass of wine (well-priced at $3 a glass), I filled up a cup of coffee and we sprawled out on the white couches outside on the back patio and planned our time in Bolivia the coming week. The hotel restaurant does offer a dinner menu each evening, but it is heavily meat-based and one thing we love most about San Pedro is the food selection in town (everything from hearty pizzas to fine dining and three-course set menus from $10) so at sunset we hopped on two of the three bikes available and pushed the rusty pedals into town for dinner. The plan was to try out the giant telescope on the back patio when we got back that second night but it turns out we don’t really know how to work it. 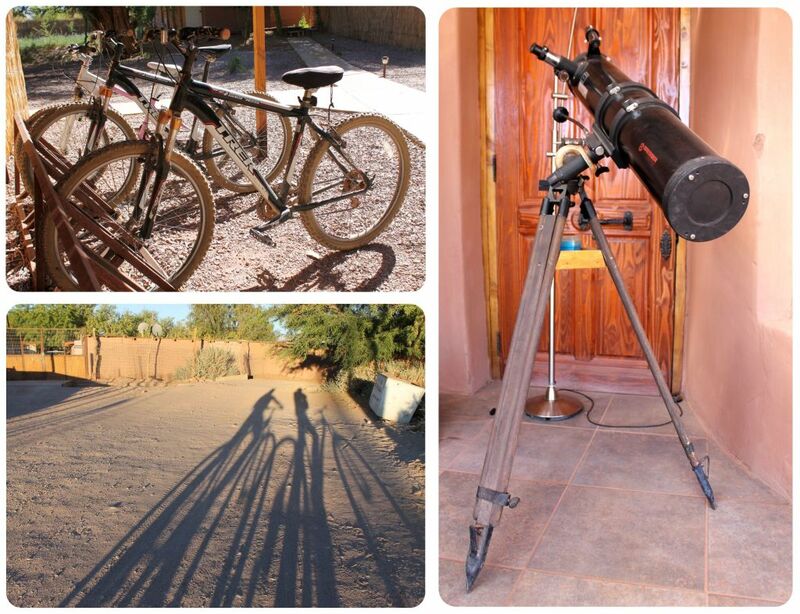 The idea was nice though, as star gazing is the number one evening past time here in the desert. The breakfast selection the second morning was much more modest, but the rest of the morning went off without a hitch. I got in a long yoga session in our room, getting all the kinks out and calming my nerves for the adventure to come. 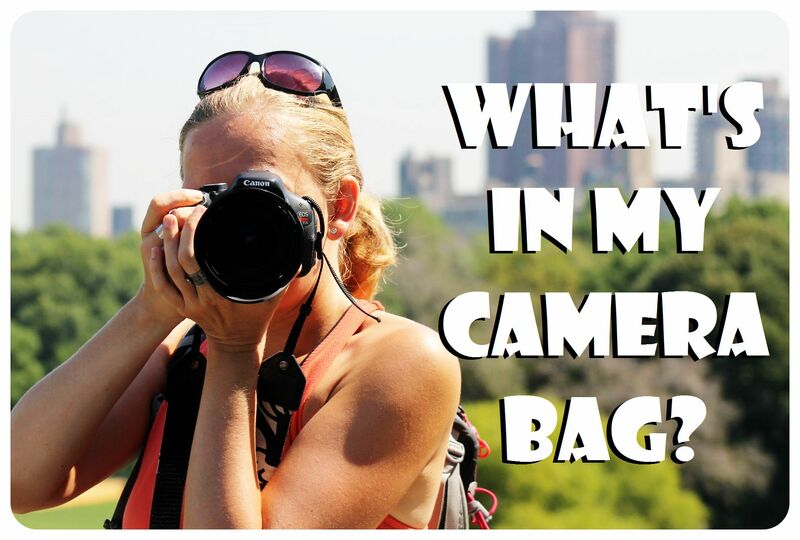 Dani sat sprawled out on big pillows in the comfortable lounge loft above the kitchen, editing photos and drinking bottomless cups of coffee from the breakfast bar – the combination of coffee and photo editing puts Dani most definitely in what you could call her element! Leaving Atacamadventure was much easier than our arrival – they simply called us a cab and hopped in and off we went to our big adventure. Even though we loved our room, what we both loved even more was not having to stay in it to relax. There are many different areas to relax: inside upstairs in the lofted lounge and outside on several comfortable white couches or lounge chairs, plus the pool/jacuzzi area had deck chairs as well. It was so peaceful to sit outside, take in the fresh air and late afternoon sun, totally relaxed and saying hi to the other guests padding barefoot back and forth enjoying their spa time. There is apparently a law in San Pedro that prohibits hotels from putting a sign anywhere but on their property, which unfortunately for this hotel, means no one could ever possibly happen to see it. 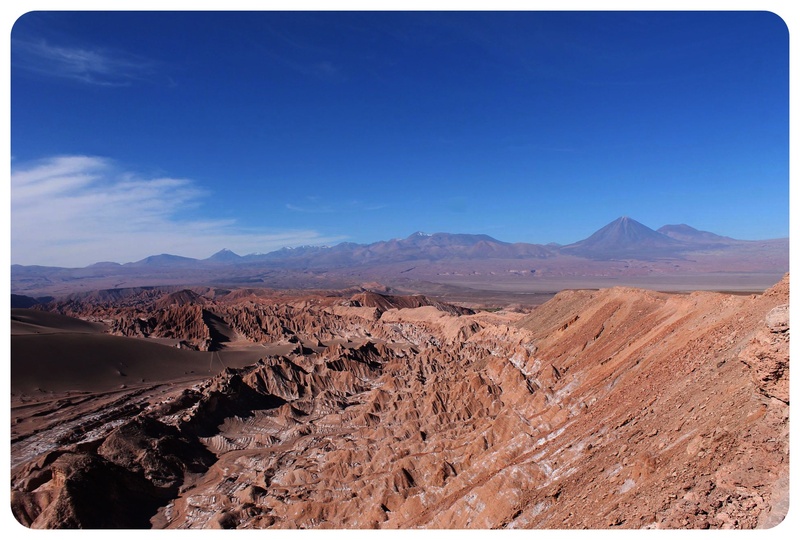 For that reason and the location itself, Atacamadventure needs to offer a shuttle service – from pick up service at bus station around town to shuttle service that brings guests back and forth from town. Two relaxing and refreshing nights’ sleep later, we got what we came for, even without dipping our toe in the jacuzzi. 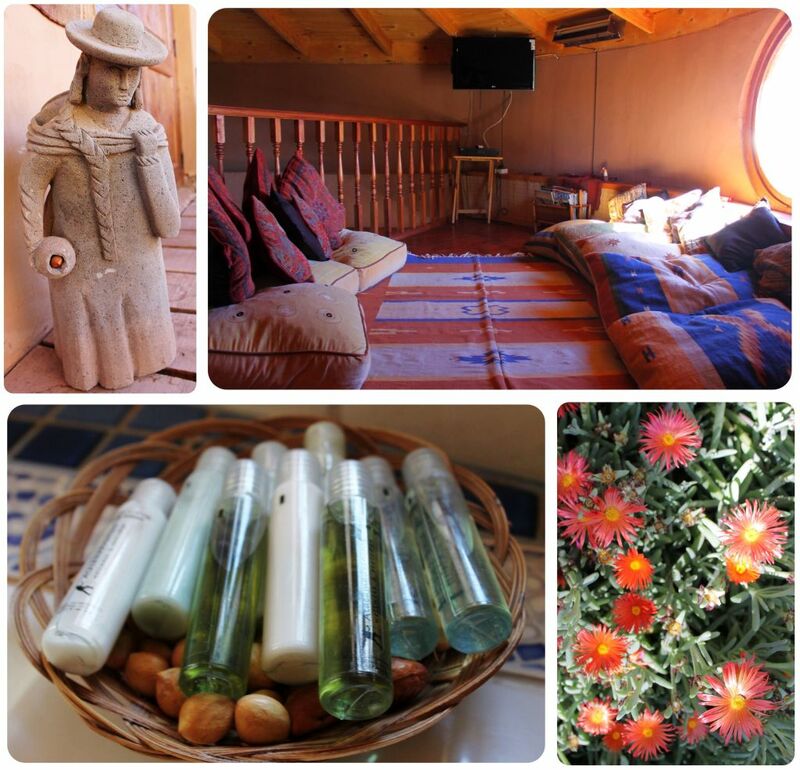 Despite inconsistencies in quality (breakfast, bikes and Wi-Fi that works) Atacamadventure Wellness & Ecolodge is a great little oasis outside San Pedro to shut off and relax for a few days at a time, especially before – or better yet after – the Bolivian salt flats tour. 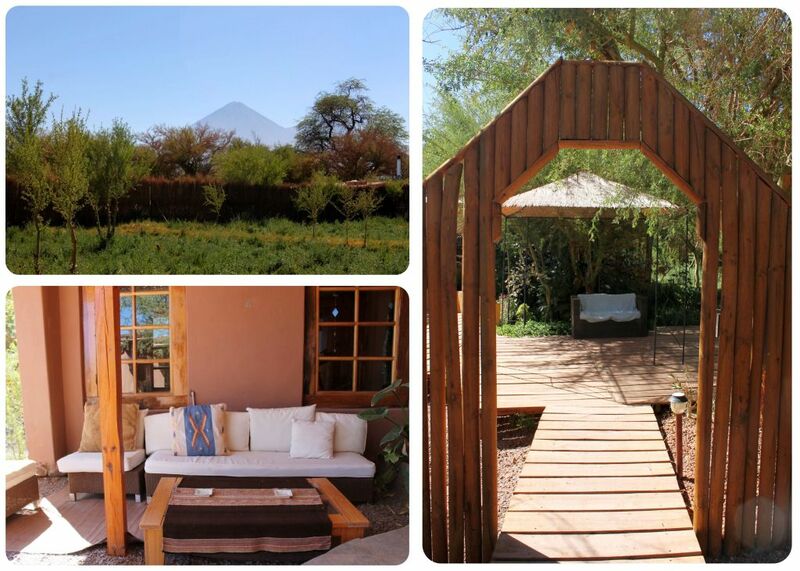 You can book your stay at Atacamadventure via Booking.com.